A few weeks ago on a Wednesday afternoon I found myself outside a cafe in downtown Athens, just a few blocks from Victoria Square. I was taking a bus to the north, Eidomeni to be precise, and I’d heard this was the place to arrange such a trip. I was sitting sitting outside the shisha cafe, my hair and clothes steadily becoming infused with shisha smoke. Keemo, a burly Egyptian with long curly hair and broken Greek asked for a photocopy of my passport, so I went to the PC centre right next door to get one. “Four copies please” I said. Fifty cents a piece for photocopying? I don’t know why it even surprised me, by now I know well enough that anything connected to the refugee situation carries a price tag that it normally never would. Bottles of water for one euro, chocolate bars for 1.50, photocopies for 50 cents. As we waited to board, people on the table next to me gestured to me. They asked me something in Arabic. “No Arabic,” I said sadly, though for the record that’s set to change soon. They explained with a mix of English and Greek. This is Ahmad, he’s 15. He’s travelling alone. Could I keep an eye out for him? Unaccompanied minors are everywhere on this refugee trail. I couldn’t imagine making the terrifying journey he undertook at 15 at my age right now. In fact, I was incredibly grateful that I had company with me in the form of Nikos, a documentary maker, on this bus trip. We were supposed to leave at 8pm. At around 8.30pm a coach pulled up and we started getting on. By 9pm, the bus had been crammed full to its last seat. Behind me, a few mothers sat with their small children, among them eight month old Missam, whose name means flower. Spyros, the bus driver, poked and prodded various parts of the bus. One passenger complained that his seat was broken. “This damn thing is falling apart.” he grumbled. A few more preparations and we began to slowly roll our way out of central Athens to head north. The mood was a happy one. As the night ran on, I got chatting to some of my fellow passengers. Sitting down at the front was 32 year old Yahyah from Syria. Before the war, he used to work in a cosmetics’ distribution company. He ticked off where the rest of his family was – seven brothers spread around Europe, one of them in Dubai and one of them still in Syria in the army. One sister and two parents still in Syria. Just behind me sat 25 year old Ahmad from Syria via Lebanon. He was upbeat and smiled constantly. He was so happy at reaching Lesvos that he swam the final 50 metres. He then spent 27 hours straight queuing at Moria camp for his papers to make the onward journey. He flicked through pictures on his smartphone of monkeys in Lebanon, kittens in Turkey and poses with the volunteers who met his boat on the island. The only topic that makes him fall silent is Islamic State. “I don’t like to talk about it” he said. The buses are more or less an illegal operation. Certain cafes near Victoria Square sell the tickets for cash, no receipts, and the trip that should take five and a half hours ends up taking nine because of various meandering detours to avoid rumoured police checkpoints. We make several stops during the night. Service stations have bumped up their prices to cash in on this unexpected windfall. At one, hot meals carried a starting price of EUR 8, an extortionate amount for crisis era Greece. Me and Nikos, both hungry after a few hours of travelling, sat down here to grab something to eat. We both complained and joked about the price of the food, and realised no one else was eating, because nearly everyone else was a refugee from one of the handful of buses that had stopped there. They had more important things to do with eight euros. I tried unsuccessfully to grab a little sleep. Several more hours passed and at last we turned off at a battered and fading road sign that said Eidomeni. We had reached. As we crawled along the road, I could see large white tents glowing out of the darkness. The time was 5.23 am. The bus groaned forward across some train tracks and stopped just outside the camp. We got off into the crisp cold air and the thin drizzle as a local volunteer tried to explain what would happen next. We formed two lines and were ushered towards a table for food, water and sanitary items. I wrapped my scarf around my head to try and stay warm in the drizzle – I was already losing my voice by this point – and went off to gauge the situation. The volunteers told me this wait was unusual. After months of chaos and violent scenes at the border this summer the operation at the border has now fallen into an efficient routine that works “most of the time”, Greek authorities say. The border with Macedonia opens every 15 minutes to accept a group of 50-80 people. When the buses finally arrive at Eidoumeni, they offload passengers at a rate relevant to the pace of the crossings. Greek police issue each bus load with a number for their group which represents the order in which they will cross. They estimate that on an average day around 5,000 people make the crossing. Kostas, a local social worker from Kylkis said he wasn’t sure why it was taking so long that particular morning. Either way, there wasn’t much to do except wait it out. I went back to our group and found Yahyah again. I pointed to his shoes, open slippers. “You’ll be very cold with those in Norway” I said. “No, I love the cold!” he replied. And this is basically what we did for the rest of the day. We waited. The drizzle finally stopped as dawn broke, but all day the sun refused to shine. The hours passed and I said to Nikos “Listen to that. Look how many children are here, and none of them are crying.” My own children by now would have turned themselves inside out from crying and complaining about all the waiting and uncomfortable conditions. Here, the small children had gone into autopilot. I heard almost no crying, and saw very little fussing. The only times I heard children really crying was when a few of them got separated from their parents. It was chaos for a few seconds and people tried various languages – Arabic, Farsi, Kurdish – to get the hysterical child to tell them who they were with. The tents at the camp are a recent development. Before they appeared, people were forced to wait out in the rain and cold for hours with no shelter, and earlier still, people smugglers made them hide in the fields for hours until they crossed. This summer, Macedonia closed the border and there were clashes and tear gas as people tried to push through. I went to sit inside one of the large tents. Exhausted people were sleeping everywhere on the grimy floor. The outside air is cool, so the inside is full of houseflies who are taking advantage of how the volume of people in each tent heats it up. Groups of refugees seeing me with my camera asked for their picture to be taken. I wished I had a Polaroid so that I could give the pictures to them. A man noticed me with my camera and notebook and came up to me. His name was Tahir Adrees and he was with his wife Nida and sons Umar, 9 and Shamal, 3. They decided to leave when a bomb exploded very close to their house. “My younger son was normal. He was a happy boy. Now he screams all the time. I think the bomb changed his brain.” The little boy sitting in his mother’s arms looks around, dazed. I haven’t been to a war zone, but this moving war zone gives some idea of what a shell shocked person looks like. Through his father, Umar describes the nightmares he sees of a man entering their house to kill them. When he grows up, Umar wants to be a teacher. 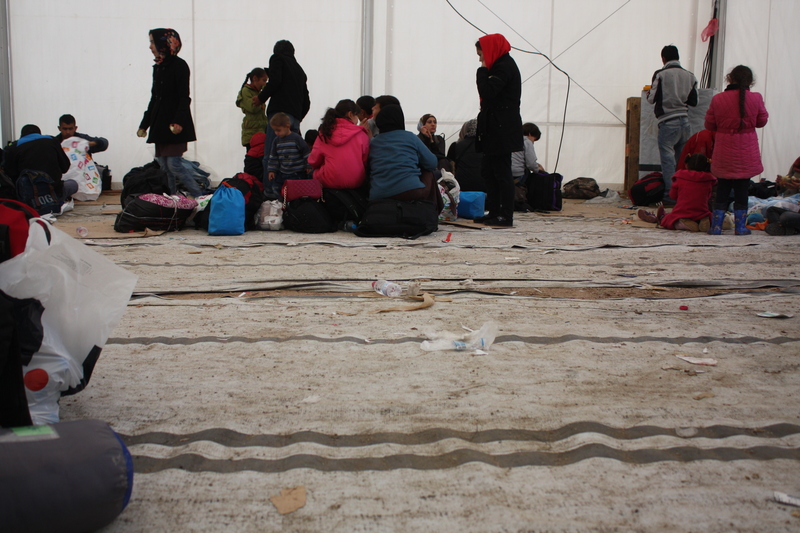 Sandwiched between two tents, a group was waiting to make the crossing into Macedonia. I noticed a man who stands out because he was smartly dressed and carried a brief case. I started chatting to him and several younger men nearby as Nikos filmed some general shots. They looked agitated. “Please, don’t film us” they ask, so we stop. They refused to give their names, scared for the family they have left behind in Syria. “We will go anywhere,” said one, pointing to his group “We want to finish studying, I was studying economics, so was he, and this guy was a mechanical engineer.” I thanked them for their time and assured them we wouldn’t use the film we just shot. They asked me again and again – don’t show it, please, don’t show the film. The man I originally started to interview is especially agitated, so I went back to him with my card. He took it and leaned in to very quietly tell me he used to be a lawyer in Syria. He stressed repeatedly that I must not use his image or any identifying details about him, and then told me, “There were no terrorists in my town. I left because of the regime. Anyone who tells you they support the regime is lying, they only say that because they are so scared of the consequences for their families in Syria.” I promised again. They have had to put their trust in strangers repeatedly, and no matter how much I promised them they didn’t look entirely convinced as they wandered away to cross the border. I find Ahmad from our group and gave him my number. “Don’t go to the border without me!” I said. “Come with us to Germany!” he said. We chatted for a while and I showed him how I spell my name in Arabic. He took my pen and notepad and wrote an alternative. “This is correct.” he insisted. We jokingly argue over this for a while. “You must be very tired.” I said. “No, I can’t feel my legs now any way.” he answered. 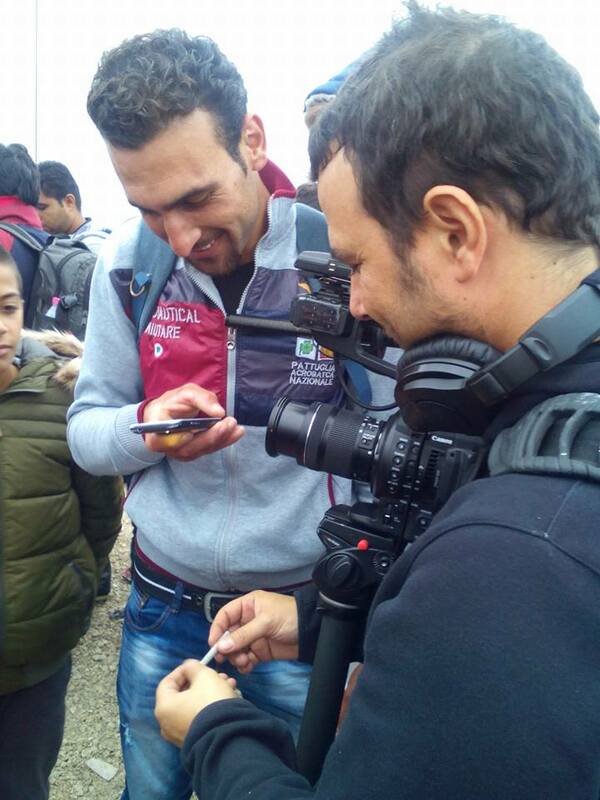 Nikos began rolling a cigarette and Ahmad whipped out his smartphone to make a video so that he could learn too. Trying to swap shoes. Ahmad’s friend on the left, Ahmad in the middle, my ‘baby feet’ on the right. We walk down past volunteers giving goody bags to the children, to the fencing that is crushed and broken from where the summer’s outbursts took place and then suddenly they cross. 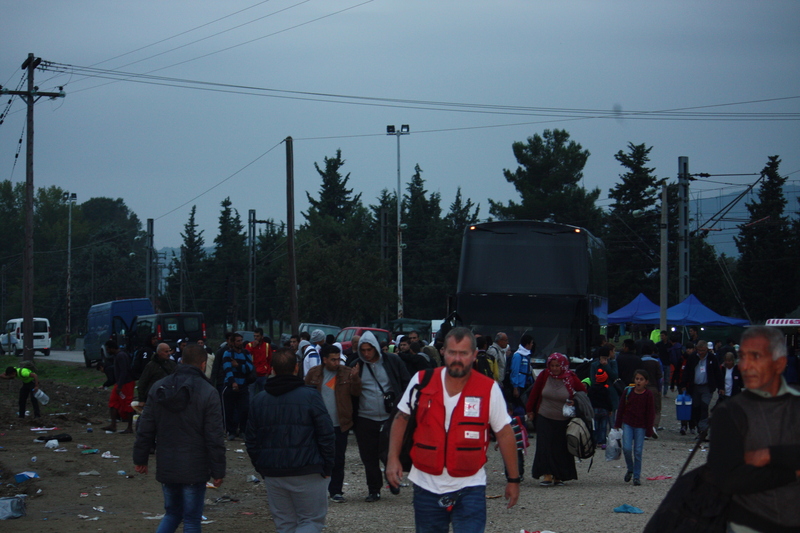 I wave goodbye – the Greek police told me I couldn’t go up to Gevgelija station with them as I’d planned. I watched them as they turned off and then they’re gone from my sight. I’m glad they made it, but I stood for a few moments watching the empty space in the thicket where they vanished, wondering what lies ahead, worrying about little Missam and the other children in the group. Would they be safe tonight? Would people be kind to them? My eyes welled up with tears, and I’ve learnt that the way to get past that is to get busy again, so I start taking pictures of the border. Me and Nikos walked through the silence towards Eidomeni’s settlement. Along the way, I picked up various little things I found at the side of the road, plastic prayer beads, discarded ferry tickets for three adults and one child. At the village’s solitary taverna, the owner tells me his specials. “The other day we had a journalist from the CNN. She ate every single scrap.” he said proudly. “Alexis Tsipras will be in power until you die so don’t die any time soon.” the friend replied, laughing at his own joke. We make a pit stop at Thessaloniki and then head to the airport to take a flight back to Athens. By now my voice had almost completely gone. I felt exhausted. My bright idea of booking the final flight of the day back to Athens, leaving at nearly midnight doesn’t feel so bright any more. Back in Athens, I take the airport bus down to Syntagma. It was now 1 am on Friday. I hadn’t slept since getting up at 7 am on Wednesday. At Syntagma, I tried to get into the first taxi I saw. “There’s a rank over there.” the driver told me, so I grumbled as I went to the next taxi and was beaten to it by a little old lady. There was no driver in the third taxi, and the fourth one wouldn’t let me take his taxi because the taxi rank rules say the taxi before him gets me as a customer. I was beyond tired by this point and slammed the door, swearing and complaining loudly to no one about how exhausted I was as I waited by my taxi for the driver. It’s a small taste of how lack of sleep can change your behaviour and something to consider when seeing images of irate refugees losing it as borders close. I just wanted to get home. They have been suspended in a repeat of my journey for weeks on end. The driver appeared, and we were off. He began chatting. I sank into my seat, silently wishing he would shut up. I was in absolutely no mood to make conversation. He asked me where I was coming from. 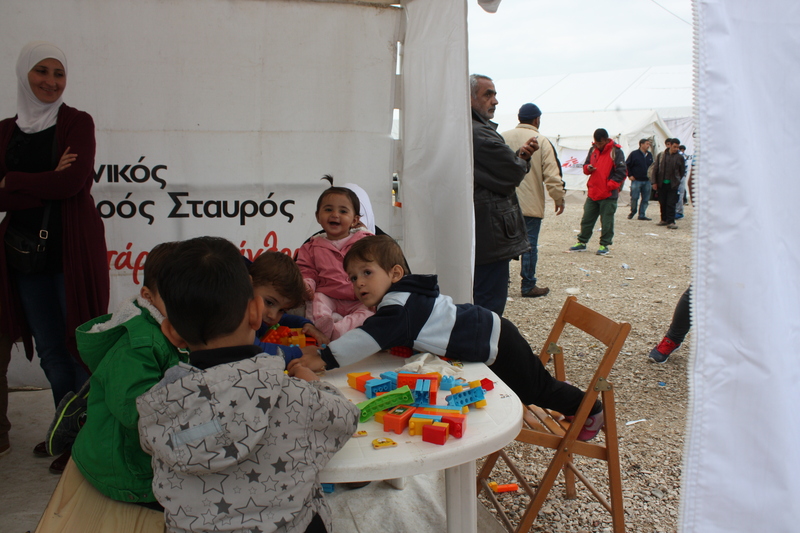 “Eidomeni” I muttered, explaining about my story. “Eidomeni, eh? Write this down.” he said. Great, I thought. Here comes another racist conspiracy theory. And then he told me a story that really got my attention. I had heard from various people about more well off Syrians taking taxis directly to Eidomeni, but apart from walking up and down a taxi rank and asking if this had happened at the risk of someone making up a story to get their name in print, I had no way of confirming it. Now, the confirmation had fallen right into my lap. “This is my taxi, I own it. You can have my name and take my number too. I’m not making any of this up.” With whatever voice I had left I squeaked my thanks and disembarked outside my home. It was 2:00 am by the time I got to bed. Since then, I have kept track of Ahmad who I met on the bus via social media and WhatsApp. A few days ago, he said he was going to Calais. I begged him not to try to get to the UK, but if there’s one thing I’ve learnt so far about the refugees is that they are resilient and determined like nothing I’ve ever seen. Calais’s Jungle camp is a hell hole. Many have died trying to get to the UK, but Ahmad is sure he won’t be one of them, although a few days ago he was downcast in his messages, saying it was very cold and he might go back to Germany after all. I hope he does. This is the article I wrote from my trip. Nikos Dayandas who accompanied me on the trip is an award-winning documentary maker. Some of his work can be found here. And this is the song Ahmad sang for me before he crossed the border into Macedonia.